Why do we celebrate Columbus - mariner of note, visionary, supreme ambition, navigator, explorer, triumphant and tragic - lessons to be learned! The history of Columbus Day can be celebrated as famous American leaders in history and upheld as a cautionary note for future generations. Columbus Day trivia - interesting, insightful and elucidating! Christopher Columbus - triumphant and tragic mariner of note, visionary, over riding ambition, navigator supreme, tyrant or hero? Controversy still exist regarding the celebration of Columbus. So why do we celebrate Columbus? Columbus Day commemorates Columbus's first voyage to the Americas in 1492 and it is traditionally held on the 2nd Monday in October each year in the USA, yet it remains open to debate whether it should continue to be honored. Columbus is a notable example of the notion that every action has consequences. His progress, expansion and achievement of new frontiers were all laudable and significant, but they too came with a price. So perhaps this is why we need to be aware of Columbus Day. It serves to confirm wonderful, ground breaking achievements, but also alerts us to causes for concern and lessons to be learned. Columbus needs to be honored and remembered for his pioneering journey that became the catalyst for the global connectivity that we experience today. He is worth studying in history as an example of someone who helped shape the world irrevocably. 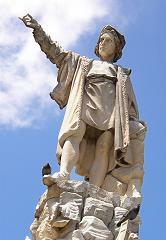 Christopher Columbus dreamed of traveling to unknown shores. He overcame numerous obstacles in his quest including current convention and led the advance to the Americas, heralded by many as the man who discovered the New World. Columbus confirms the notion that perseverance and persistence can triumph over obstacles and that tenacity and strength of purpose can lead to something noteworthy in the annuls of history. His role in discovering the Americas is viewed by many as a turning point in history and it is this achievement that is worth celebrating. However, Columbus's contribution to history should also be viewed against the context of Columbus the man - imperfect and not always the paragon of virtue. His achievements came at a price - exploitation, slavery, oppression and tragedy. It alerts us to injustices perpetrated in the name of expansion, scientific thinking and extending boundaries...so that current and future generations will hopefully be more mindful of their actions and indeed their consequences. Hopefully we will honor his remarkable achievement, but at the same time note the ideal as we strive to do the greatest good that we can do for the greatest number of people. Why do we celebrate Columbus - endeavors recognized and lessons to learn - a good informative speech topic too.